Interactive Transcripts is a cool, relatively new YouTube feature that is designed to enhance your video-viewing experience. You might already be familiar with subtitles for films. They are there to supplement the audio to help viewers better understand what's being said. 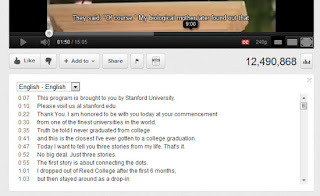 YouTube now has a feature, Interactive Transcripts, which act just as subtitles, but they are interactive, which means not only can they be played with the video, they can also shown separately and made clickable, so that when you click on a certain piece of text, it will take you to that point in the video where it was said. In this post, we'll talk about how you can create transcripts, and how to add them to your YouTube videos. There are many uses for these transcripts. Primarily, they provide subtitles which can be turned on or off according to users' preferences. But a great plus point is, they make video content searchable! People can simply search for a piece of text, say a song lyric, and come up with a video! They can then mouse over and click on that lyric to hear the song at that particular point! Cool, huh? People no longer need to remember video titles or links, so long as they know what's inside that video. Notice how each line is separated by a double line-break. This denotes a pause between the two lines. If there's shouting or laughing, and nothing is being said, it's best to include something like [laughing] or [shouting] to let the viewers know what's happening. The reason you should do this is because YouTube takes care of the timing of these transcripts for you. It has advanced algorithms and a speech recognition system that automatically times the lines with the speech. So the sound of laughing or shouting might throw it off, which is why it's best to include a hint. You can manually add time-stamps for your video in a text file, and save it with a .SUB or .SRT extension. By now, you should have your transcript ready. Log into your account on YouTube, and click on your username on the top-right corner of your screen. Then click on Video Manager to manage your uploads. You can add transcripts to your existing videos, or you can upload new videos. Next your uploaded videos, you will see an Edit option, and an arrow next to it. Click on the arrow, and select the Captions and Subtitles options. Next, you'll see the Add New Caption or Transcript option. You can now upload a transcript or caption file, which will automatically be integrated with your video once the initial processing is done. And that's it! You should now see a transcript button when you open your Videos' public link. Make sure before uploading the file whether you have selected the correct language, and whether it is a caption or transcript. Both work differently, so make sure you choose the appropriate option. You can turn on captions for any Video (if provided). This could be a great help for non-native speakers of the video's language. So upload them now, and make your videos more accessible and get one step ahead in marketing your videos! :)! when mind stops, topics directory came to an termination :) always similar things are produced ! ^_^ np! keep up the hard work! very nice and informative post thanks for sharing. Great method brother. i think this is one of the best method to attract readers. really very Good and Informative post Bro.!! This is really nice! !, but I have a question... I have seen that in some websites the black menu in the youtube videos, instead of being black the color of the menu is grey, do you know how to do that?